We gathered as a community on 11/3/18 a week after the carnage in Pittsburgh – Jews, Christians, Muslims – people of faith and people of no faith – to remind ourselves that across the millennia, in different places and cultures “do unto others” arose as a central ethic of communal responsibility and remains to this day the path that brings shalom – peace and wholeness. A local newspaper report of our gathering may be viewed here. One of our guests wrote a poem that he wrote for the occasion and recited to those gathered. It invites reflection and resolve. We thank Harvey Trieff for his words. On our arms we all had stamps. On the eve of a peaceful Shabbat. And 11 innocent Jews were shot. And spoke to God from a pew. Guilty of nothing but being a Jew. Is it too late to end this hate? Is there nothing that we can do? That’s the meaning of being a Jew. Harvey Trieff resides in Fall River with his wife Judy. They have 2 daughters and 3 grandchildren. 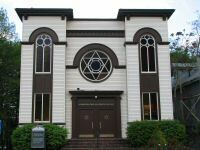 Harvey is a member of Temple Beth El in Fall River and served as a member of its Board of Directors. He is currently the owner and operator of “At Your Service”, a Limousine and Courier company. He is active in Rotary International, having served as past President and currently serving as Secretary of the Rotary Club of Fall River. He enjoys spending time with family, playing golf and writing poetry.